Gujarat Nature Conservation Society,Vadodara is a Non-Government organization working for Nature Conservation and Nature Education. 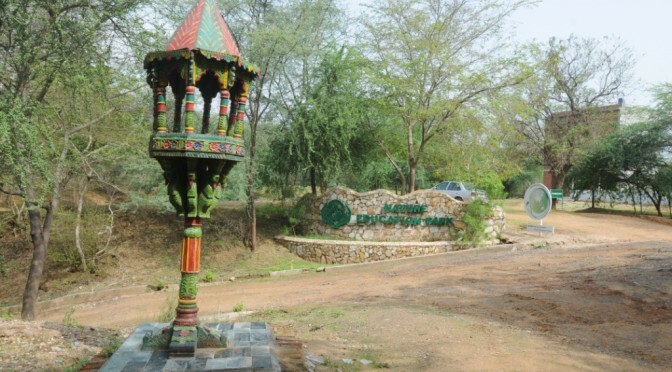 The Nature Education Park, developed and managed by Gujarat Nature Conservation Society, is situated at village Sindhrot, 15 kms west of Vadodara town. The Park, located in ravines of the river Mahi, is ideally suited for camping, besides offering other attractions. The Park inter alia offers A forest for camping and multiple infrastructure for Nature study, Trekking, Photography, Outbound training for Corporates, Bird watching and adventure activities. The Park has basic amenities for lodging and boarding.Library, a simple Conference Hall equipped with audio-visual equipment, Amphitheatre and Splash Pool.A small Insect Museum; Fossil, coral and crystal collection; a demo energy park and a weather station. Gujarat Nature Conservation society Vadodara, has introduce new online registration process for Nature Park visitors, Kindly Visit Registration page and select your applicable category to register your park visit. To know details about what to see in park, Rules and regulations for visitors and Fees and charges applicable check out new Flyer.